Home | Aircraft | Services | About Us | Contact Us | Help? Many Avia clients are among the most recognizable names in domestic and international business, industry, sports and entertainment…and our projects have included capital preserving Head-Of-State and government applications. Out of respect for developmental and humanitarian demands that must contend for support from the finite treasuries of sovereign states, Avia is keenly sensitive to minimizing the expense of government and executive branch transportation requirements. This is a gratifying approach to business, particularly when emerging nations are the beneficiaries of our undertakings. Background in the cockpit...began flying at age thirteen...airline pilot at age twenty-one. In corporate jet sales since 1976 conducting business in much of the free world and occasionally beyond...completed jet purchase, lease and sale transactions in 40+ nations, on every continent...involving jet aircraft numbering in the hundreds. Founder - California Businessjets an aircraft marketing and operations company...and, San Francisco AirFinance, a private equipment leasing facility specializing in jet aircraft...and Avia Films, an undertaking in the lively arts with Herbert von Karajan involving cinematic means of preserving Salzburg Music festival, Vienna and Verona Opera productions. Author – US Civil Airline and Preparedness Planning Roles in International Natural Disaster Assistance (1975). For own account...completed new and used aircraft world-wide searches; purchases, sales, and lease transactions; flight department set-ups; fan jet engine retrofits of Hawker turbo jet powered aircraft; avionic, mechanical, paint and interior design - refit projects for used jets; design -completion oversight projects for new jets; and documentation authorship for all such functions. For the account of clients...completed a volume of the above listed projects plus the re-winging of Gulfstream II’s; part 135 certification, set-up and management; fractional ownership/usership and unique charter projects; flight department management. Recognized aircraft appraiser...as expert witness in federal court called upon by the U.S. Government; and in connection with valuations for lending institutions and for Avia clients. Consultant...engaged in several countries to author studies regarding aircraft justification, flight department restructuring, air carrier start-up, route studies and equipment/investment comparisons. Completed transactions involving...contracts with most manufacturers; the majority of jet powered models, and certain turboprops; and involving a variety of refurbishment and completion centers in Europe and North America. Conducted design work, managed refits or completions involving...jet powered models of Airbus, Beech, Bell, Boeing, Bombardier, BAe/Hawker/Raytheon, Cessna, Dassault/Falcon, Embraer, Gulfstream, Lear, Sikorsky, and Westwind. Ralph Carter first joined Mr. Stubbs in their mutual aviation undertakings in 1974. His background includes that of a naval officer, aviator and business jet aircraft and airline equipment lessor affiliated with one of the largest banking institutions in that field, Security Pacific Leasing Corporation. Ralph holds an MBA from the University of Pennsylvania's Wharton School of Business and contributes his deep background in business management and business jet marketing to the team. His undergraduate work was completed at Hobart College and he studied law at the John F. Kennedy School. California Businessjets Partner…Co-Founder of San Francisco AirFinance. Experienced…in world wide searches for optimal aircraft for client investments and for investments for Avia's account…in the negotiations for such acquisitions. Experienced…in the conduct, negotiation and documentation of purchase transactions, leases of every variety, lease equipment portfolio management, imports, exports, refits, engine overhauls, Hawker fan jet retrofit projects, Gulfstream wing retrofits, avionic refits, major maintenance events, deliveries and closings. Experienced…in the mounting of international sales campaigns for Avia owned aircraft and those owned by clients…in the conduct and documentation of sales transactions and the customer care associated with after sale follow-up. Experienced…in consultancies, feasibility studies, market analysis and market trend analysis, appraisals and future value projections…in the set-up of flight departments and flight department management. Completed transactions from Buenos Aires to Brussels; Sydney to Moscow; Johannesburg to Vancouver. Background in Military Aviation, the Airlines and Business Aviation...USAF C-130, C-141 and C-5A Aircraft Commander, Instructor and Flight Examiner...Delta Airlines Captain rated in the Boeing 727, 737, 757 and 767...and type rated in business jets. Experienced...as a Squadron Executive Officer and Squadron Commander. Served as USAF Wing Vice-Commander and Wing Inspector General...Air Force Airlift Command Combat Veteran of the Gulf War and Vietnam, rising to the rank of Colonel. Experienced...in line pilot operations in domestic US and international routes, including Europe and Asia...in Check Airman and FAA Designee roles...and as the Pilot Base Representative to the Airline Pilots Association (ALPA). Experienced...in Business Aviation, including the authorship of FAA FAR Part 135 Certification Documentation and Operating Manuals, plus the conduct of, and stewardship of, the Approval Process, interfacing with the FAA from initial application through final approval. Member of Avia's team available to our clients for Transport Category Aircraft sales and purchases...from mission analysis and feasibility studies...used asset analysis, used aircraft purchase negotiations, used aircraft refit planning, the oversight of refits, updates and conversions to closings and placement into service...plus, new equipment spec’ing, newly manufactured aircraft ‘green production’ oversight and acceptance, as well as new aircraft completion planning and oversight. Education...graduate of Principia College...awarded ‘Distinguished Graduate’ honor, USAF Pilot Training, 1969...Tactical Airlift Training; Survival School; various Boeing and Lockheed Aircraft Initial and Recurrent Pilot Training Schools...and MBA training. Background in Aircraft Technical Services… A&P rated; Completion Management specialist with project oversight savvy in challenging situations. Experienced...in the green delivery and completion of most business jets and knowledgeable of the maintenance of transport category aircraft. Experienced… in all tech functions of newly produced, newly completed jet aircraft… specialist in on-site transitioning of the Flight Departments of clients into new, complex aircraft models and into their new cutting edge sub-systems and avionics. Experienced...in production testing and post-production flight-testing roles with major manufacturers...quality control assurance and pre-delivery testing. Extensive education...training, re-currency training, line maintenance and specialty schools re Airbus 300 series; ATR; Boeing 737- 300, 400, 500, NG; Gulfstream 4, 5, 550; Global Express, GEX-XRS; Hawker; EuroCopter; Rolls-Royce; and Allied-Signal. Aircrew training...medaire training...active consultant for more than twenty years. in North America, South America, Europe and over most other major international routes. Experienced... in the corporate operations of Transport Category aircraft, including, as Chief Pilot, transitioning the Trump Organization into a VVIP Boeing 757 from a VVIP Boeing 727...operated domestically and international as Captain. Experienced... in airline Part 121 flight operations...pilot for United Airlines...knowledgeable of contract, cargo and scheduled air carrier operations, having begun his airline career in the mid 1990’s. Experienced... in spec analysis, maintenance analysis, modifications and systems status...in the negotiations for all operational services common to the Chief Pilot's role of a corporate Boeing operator...in flight test, function tests and placement into service/return to service procedures. Administration degree... has undertaken initial training in various make and model jet aircraft, international operations and recurrency training, as appropriate. Background in flight operations and flight department management...thirty-four years in the cockpit of business jet aircraft...with a perfect safety record. Type rated in Global Express, Gulfstream, Falcon, Hawker, Sabre, Lear, Beechjet, Citation and Westwind models...helicopter rated...and has operational experience involving every continent and every significant over water crossing world-wide. Experienced... in mission analysis, feasibility and justification studies. Experienced... in domestic and international flight department set-up, Part 135 set-up and operations, safety audits...routine and long range maintenance planning...organization building, crew and staff management and training...facilities management&...fleet wide asset management. Experienced...in new and used purchase negotiations...acquisitions, spec analysis, modifications...completions and refurbishments, mechanical and avionic refits...including the negotiations for same...flight test, function tests, acceptance, delivery and placement into service procedures. Founder - Flatirons Aviation Management, Inc...Director of Flight Operations and Aircraft Management for Avia clients through FAM. Accomplished aircraft and yacht designer since 1980...Industrial Design services involving prototypes, mock-ups and product development...lighting, window assemblies, seating, furnishings and accessorizing. Clientele include transport category and business jet modification facilities and completion facilities plus component manufacturers. Experienced...in concept design, solid modeling, material and finish specification. Experienced...in airline layouts, unique first class and high density airline LOPA arrangements...cabin suites and private quarters for VVIP new completions and conversions and has extensive experience with the current Airbus family from the A-318, 319, 320 to the largest production models. Experienced...Airbus, Boeing, Embraer, McDonnell-Douglas, Dornier, Gulfstream, Challenger, Falcon, Hawker and Lear high end design and project management undertakings. Founder – Mauricio Cabal Design Studio...Director of Design Concepts and Completion Planning for Avia. Background in business jet and transport production...began at age eighteen in Canadair Production Training. Airframe Mechanic…Graduate of the National Aerospace Academy…Instructor at the Aeronautics School of Montreal. Production and completion management executive since 1979…filling various roles in the production of 'green' Canadair and DeHavilland aircraft for fifteen years…held the position of Program Manager of Bombardier's Tucson Completion Center and the critical role of Customer Relations Manager reporting directly to Bombardier Headquarters Senior Management. Experienced…in all the key issues associated with the 'green manufacture' of new business jets and transport category aircraft purpose built for corporate service…in quality control and remedial analysis…in all the key points of 'green acceptance' and preparation for completion facility input. Experienced…in all functions associated with the completion of business jet and transport aircraft including Bombardier, Boeing and Embraer products…in all the completion build-out issues, mods, options, subsystems, installation, documentation, inspection and testing of new completions, remedial work and refits…ten years with Challenger, RJ, Global Express and Lineage program development, completions, delivery and placement into service. Experienced…in negotiations, documentation and contracts associated with all elements of the above functions. Experienced…as the manufacturer's internal consultant for the restructure of non-company owned completion centers in the United States and Europe. 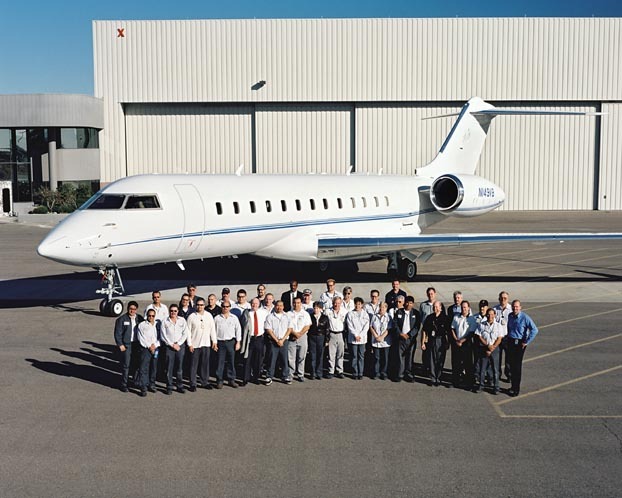 Recognized authority on Bombardier, Challenger, Learjet and Embraer Lineage products…associated with the completion of aircraft going to operators all over the world. More than forty years in Aircraft Maintenance and Maintenance Facility Management… US Navy Flight Crew Member… and civilian pilot. Experienced… in Flight Line Maintenance and Inspection responsibilities for 747, 727 and 707 aircraft as employee of the Boeing Aircraft Company. Experienced… Director of the sole British Aerospace factory owned Service Center in North America… Supervisor of over fifty employees and the administration of the every day Corporate Jet Service Center operations. Expert in work scope, manpower and schedule implications in all jet aircraft maintenance undertakings - from the perspective of the consumer and the facility, alike. Experienced… in all corporate flight department management and technical functions. Skilled in bid work scope analysis, quotes, work oversight, contract authorship, work order processes, pre-purchase inspections, green aircraft acceptance, newly completed aircraft acceptance, aircraft modifications, refits, ground test and flight test procedures. Experienced… in the operation, technical services, and maintenance support of Falcon, Challenger, Hawker, Astra, Westwind, Beech and Lear models… in flight department set-up and multiple aircraft flight department operations… in documentation, records keeping and regulatory compliance. Education… graduate of Military AM School, various military and civilian jet aircraft tech schools for airframe and powerplant maintenance, APU maintenance, individual aircraft types and flight crewmember training, including FSI. Background in military and civilian aviation maintenance...25 years experience in technical services in military, civilian airline and civil business jet operations. Served in domestic settings and in combat zones. Experienced...ranging from US Air Force B1 structural engineering support to Huey & Blackhawk helicopter crew chief and mechanic roles in military assignments. Experienced...in civilian undertakings re Boeing 727, 737 & 757 maintenance for major airlines, to Gulfstream 2, 3, & 4, Hawker and Falcon maintenance for corporate operators. Experienced...in flight department set-up, daily operations and long term maintenance planning; Military flight line operations... civil business jet Director of Maintenance and Contract Maintenance. Expert in aircraft structures, APU’s and powerplants from the PT-6 to the largest commercial engines. Experienced...in FAR Part 91, Part 135 and Part 121 Air Carrier maintenance, operations, regulations and records keeping. Consultant in the disciplines of operations and the economics of jet aircraft support.